Recombinant Pig TNF alpha (PPP029) detected using Rabbit anti Pig TNF alpha (AHP2397) as the capture reagent and Rabbit anti Pig TNF alpha:Biotin (AHP2397B) as the detection reagent followed by Streptavidin:HRP. 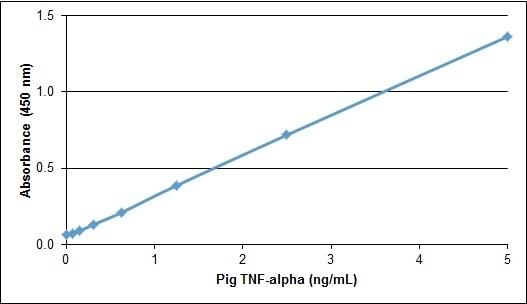 Recombinant Pig tumor necrosis factor alpha (TNF alpha), also known as tumor necrosis factor ligand superfamily member 2 (TNFSF2), corresponds to aa 77-232 of native pig TNF alpha. This recombinant protein is produced in yeast cells and is naturally folded and post translationally modified. Pig TNF alpha is produced by a range of cells, including macrophages, monocytes, T and B lymphocytes and is an important mediator of the porcine inflammatory response. This product may be used as a standard in immunoassays. This reagent may be used as a standard in a sandwich ELISA assay in conjunction with AHP2397 as a coating antibody and AHP2397B as a detection antibody.